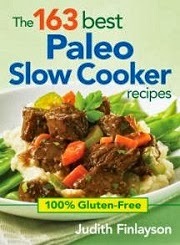 The 163 Best Paleo Slow Cooker Recipes is a 224 page cookbook featuring 163 gluten-free recipes. The cookbook is written by author Judith Finlayson and is published by Robert Rose books. The Paleo diet is one of the most popular diets being followed today and has been embraced by nearly 1.5 million people in North America. The basic principle of the diet is that the recipes contain no grains or legumes (therefore making all of them gluten-free), no refined sugars and no refined oils or processed ingredients. Slow cookers are hugely popular because they're so convenient and the results so delicious. All the recipes in this book pay very close attention to paleo guidelines, while also recognizing that there's a wide variety of reasons that people choose to eat paleo that go way beyond weight loss. My Thoughts: I am new to Paleo cooking and even though I don't focus on this type of cooking in our menu planning, I have enjoyed learning more about it through this cookbook. Even if you don't do an official Paleo diet, you will still enjoy the tasty recipes contained inside the pages of this book. One of our favorite meats happens to be pork so we decided to try out their Farmhouse Pork Stew recipe that is featured on page 176. This is one of the more extensive recipes in the book but it was well-worth our efforts. Once we had everything prepared we slow cooked it in our slow cooker for about 4 hours on the high heat setting. What is really nice is that the author gives you various tips on preparation and/or serving with all of her recipes. We thought this one was delicious and definitely will be making it again. Another thing I loved about this cookbook is that she includes various homemade condiments recipes in the back. I found her homemade horseradish recipe and whipped that up to serve with some fish we had a few nights ago. It only requires 5 ingredients and wow...it was delicious! Way better than store bought junk! In 2 weeks we are hosting a dinner party and we are going to make the author's Poached Pears in Chocolate Sauce for the dessert. The recipe looks very easy to prepare and will serve 6-8 guests. I love pears and I love chocolate, so I think this one will be a keeper too! Within the pages of this book you will find some full color photographs of some of the completed dishes. The photos are mouth-watering and will have you wanting more! 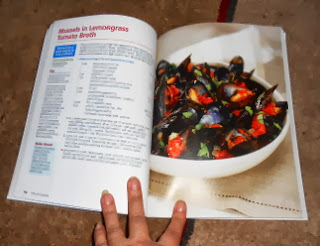 I only wish that each recipe came with a photo but that is okay...I am still pretty impressed with my new cookbook! You can find this cookbook and many more by visiting Robert Rose online.